I love this time of year...days that start out crisp and cold then slowly change into warm afternoons, leaves just starting to change color and apple trees dripping with big juicy apples. 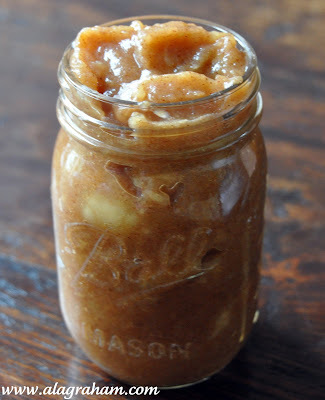 I recently received a bag of the most delicious apples and couldn't decided what to make...really they were so good that we ate them like candy for a few days and then I decided to try something new...apple butter. Honestly, the name always scared me away, I always thought butter was involved and was happy to find out it has nothing to do with butter. It is basically just a sweetened and thicker version of apple sauce. This is a great recipe to use up all those autumn apples. 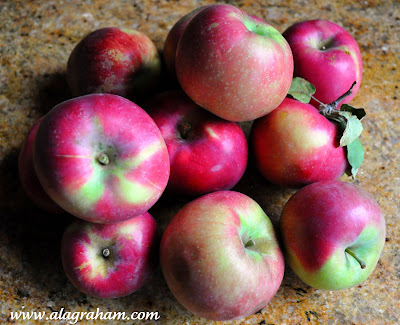 Place apples and apple cider in a large pot over low heat, uncovered. Cook apples slowly, stirring occasionally, until they begin to fall apart, about 30-45 minutes on a gas range (could take up to an hour). 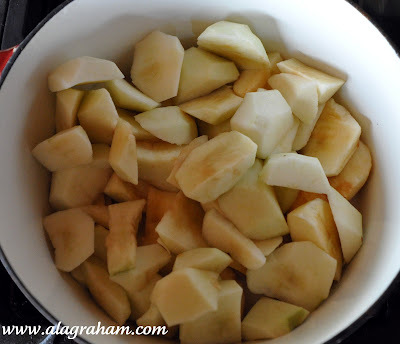 Use a potato masher or a stick blender to puree the apples. You can either puree until the mixture is completely smooth or you can leave small chunks, depending on your preference. Taste the apple puree and add in honey, brown sugar, or agave syrup until it reaches your desired level of sweetness. Stir in the cinnamon, cloves, and allspice. 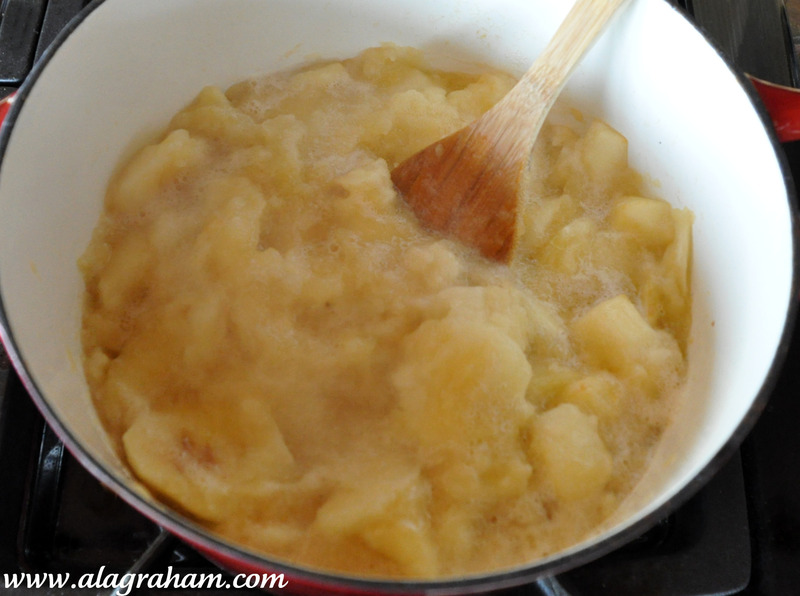 Continue to cook the apple puree over low heat until it thickens, stirring frequently to keep it from sticking to the bottom of the pot. The apple butter is finished cooking when you can drop a spoonful on a plate and it forms a stiff mound that does not have liquid running around the bottom edge. Let the apple butter cool and then store it in an airtight container in the fridge for up to two weeks or in the freezer for a year. I love this apple butter. Your are right about this time of the year. The people I work for had a million peaches from their farm and I made a peach mermelade which I will be posting. So simple to do and its from our kitchen not the supermarket. Great! Mmmm I love fall food! Apples are a favorite of mine. 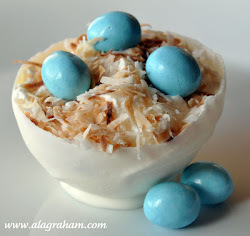 Never heard this recipe, sounds yummy!I love this period of the year too . . .also because my bithday and my babygirl's one (10 yrs) are in October so we use to bake lovely cakes for our parties! 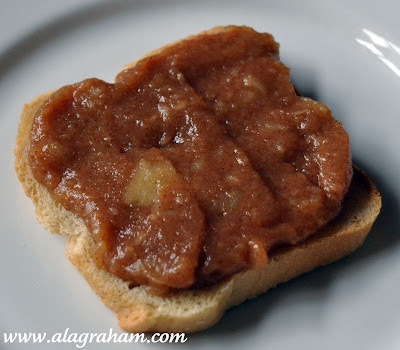 Love the apple butter, but never really knew that it could be so healthy! I love the idea of adding in honey or agave in place of sugar. Great idea to stir this into oatmeal and add on top of pancakes. I think a trip to the apple orchard is in store for me today. Off to catch up on your other posts. can't wait to try this! looks delicious!!! I'm so glad that you enjoyed this recipe! Your apple butter looks beautiful. It is the best breakfast spread this time of year! Thanks Phoo-D! Its a new favorite! I have discovered I like it best stirred into oatmeal...its perfect! Oh my! This looks delightful! Bookmarking this one too!